I spent much of the day prepping for two short classes I am teaching on service dog access law. I’ve done this before, but most recently, I had an entire semester to teach students about access law and other dog-related laws. We spent seven weeks on the crazy quilt of federal laws that govern public access for people who have service dogs. Paring the vast amount of information down to two one-hour presentations is tough. Beyond that, I hope to give this group of students an overview of the applicable laws and plenty of info on where to get more in-depth information. The biggest problem with the number of laws and variations in how and where they apply is how easy it is for people to break the law — sometimes intentionally, sometimes not. People often confuse service dogs, therapy dogs, and emotional support animals. Service dogs, individually trained to assist a specific person by performing tasks that mitigate that person’s disability, are often seen in malls, restaurants, supermarkets — almost anywhere that members of the public can go. 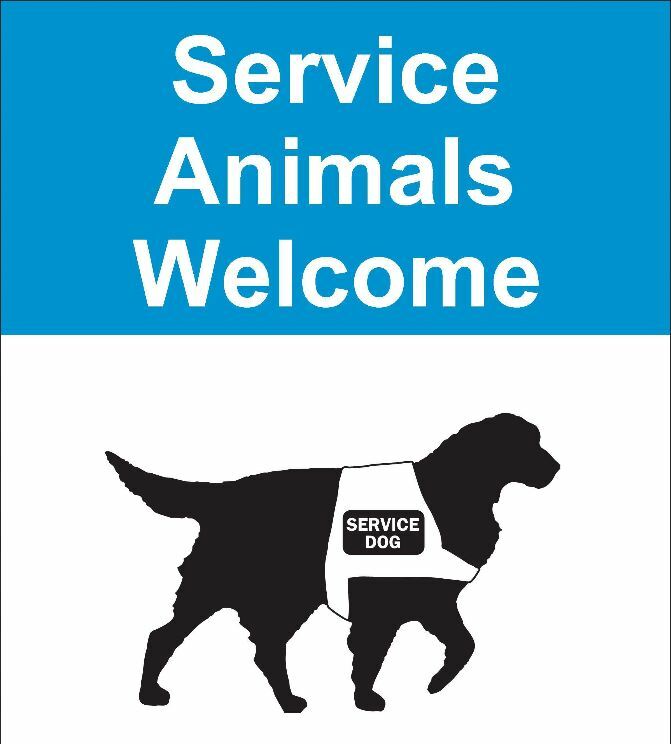 The ADA, the Americans with Disabilities Act, gives people with an ADA-recognized disability the right to take their service dogs into these places. But dogs that merely provide comfort or “emotional support” are not considered service dogs. Animals other than dogs (with limited exceptions for miniature horses) are not covered by the ADA. However, people can get permission to live with an emotional support dog or other animal in housing that doesn’t allow pets. Other people get their dogs certified as “therapy dogs” and visit hospitals, schools, and other places that normally do not allow pets. What gives? Different laws govern access to housing, air travel, Veterans Administration facilities … the laws are confusing. There is no requirement for any kind of public access test or identification. Emotional support animals that accompany people in no-pets housing or on airplanes are not required to have any training. Many people honestly believe that they have the right to take their pet along to the coffee shop because they have a letter, a “prescription” that turns their pet into a service animal, or because they’ve passed a test given by Pet Partners or another therapeutic pet organization. Other people know that they are breaking the law when they purchase a vest online and head off to the coffee shop with Fido in tow; they just don’t care. They also might not think they are harming anyone, but that’s often untrue. Most pets are not temperamentally suited for the stress of being in public. Stressed-out dogs might pant, drool, pull toward an exit, hide behind the handler — or become aggressive. It’s not fair to subject a pet to this level of stress. A dog that is reactive to other dogs, has high prey drive, or any tendency at all to behave aggressively should not be in public. These dogs pose a threat to other people and to people with legitimate, well-trained service dogs. What’s important for everyone to know, whether members of the public, pet owners, or managers and employees of businesses, is that the right to access is not an absolute right. A person can be asked to remove a dog who is misbehaving, is showing aggression, or is not under the handler’s control — even if the person does have a disability and even if the dog is a trained service dog. Asking a person to remove a dog under those circumstances is not a violation of access laws. Ethical service dog trainers are careful about which dogs they place as service dogs, both to ensure that the person’s needs are met and to ensure that the dogs they place are comfortable and safe working in the public eye. Service dogs get lots of attention, including petting and hugging from random children (and adults) who run up to them out of nowhere. They endure a barrage of noises, smells, and sights that most pets cannot even imagine. Not all dogs can (or want to) do this work. It’s unfair to expect an unprepared, untrained dog (or other animal) to behave perfectly and calmly in public, even if he is wearing a really nice vest. And it is unfair and unethical to endanger properly trained working dogs and members of the public by taking a poorly prepared, frightened dog into situations that he or she cannot handle. I understand people wanting to take their dogs everywhere with them, but c’mon people, it’s against the law. If that’s not a good enough reason not to do it, I don’t know what is. It’s frustrating that some folks don’t consider the real need for Service Dogs. When they decide to buy and use the vest to gain access with an untrained Fido, it ruins a good thing for those who have an actual need. On the other hand, Service Dogs are amazing! Through a friend I know someone who is training a Rottweiler as a seeing eye and seizure detecting Service Dog. It’s just amazing.